New pendants are up on www.RockerJewlz.etsy.com. I had a lot of fun with these. They are enameled one inch rounds that I've suspended from a handcrafted lampwork bead captured between shiny silver caps. I have them in robin's egg blue, primary red and chocolate brown and only one full alphabet in each color, so move fast if you need one or a few. 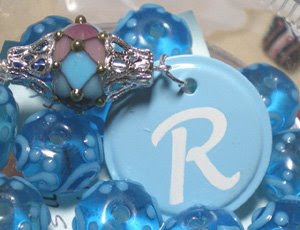 Including shipping, they are under $20 which makes them perfect as stocking stuffers and gift exchanges. There is a gentle rain outside and for the first time this season, I turned the heater on just to take the chill off. Once our Marinara Meatloaf is in the oven, I can turn off the heater. It's a really yummy recipe my sis turned me onto. Just a nice change, ya know? So my husband is apparently far more clever than I knew! 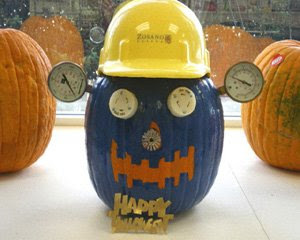 He entered his company's pumpkin carving contest and won first place! He didn't carve the pumpkin but he painstakingly created stencils of bats and "happy halloween". 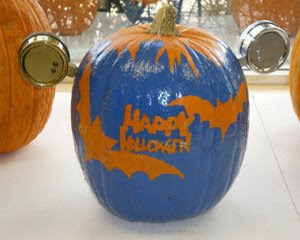 He placed them on the back and then spray painted the pumpkin blue. When he removed the stencils, he had a finished product in the company's 2 theme colors...very clever. Since he is part of the facilities department, he wanted a face and hard hat so his boss scoured the site throughout the day and came up with parts that created the facial features...that nose is an emergency ceiling sprinkler! So clever and funny. My husband isn't much of a coffee drinker so he turned over the winning Starbucks gift card to me. Happy Halloween to me. I'm having a great time coming up with inexpensive but pretty jewelry for the holidays so keep visiting my Etsy shop and stay cozy! Hey, Sandy, that's not a bad idea...maybe I'll just get him to join my MomsArt shop over there.